With Patch Tuesday coming tomorrow, there are all sorts of threatening scenarios at work. Anyway, now’s the time to make sure you’ve gummed up the automatic update works. Full instructions in Computerworld Woody on Windows. EP 1 month, 2 weeks ago. I just read that 1903 does not play nicely with vmware. Seems we’ve heard that before. The Microsoft response? Use Hyper-V as an alternative….. Yeah right. Let’s abandon all the money invested our organization has spent for hardware and software with vmware. That won’t fly. I’m having problems with the 1903 Insider Preview in my Parallels VM as well. Haven’t been able to install an update since Build 18343.1 (latter part of Feb). This is on a VM that has regularly updated without a problem since v1607 in March 2017. The past “March” feature updates weren’t released until April. Is there something new going on that you’re heard about? I block mine for two months, but install them manually as soon as I can, after I make a drive image. I can’t trust an update to not screw up my computers, or my customer’s computers. Images are a necessity prior to installing any update. Insider Previews have been dropping like flies on the Fast Ring lately with more-than-once-a-week frequency. That is usually a sign that MS is making an effort to squash as many bugs as possible (or change the color of something, or make something a little less round) immediately before pushing a Feature Update out the door. I’m a long time Windows 7 home user. It’s almost time for me to bite the bullet and buy a new Windows 10 Pro desktop PC. 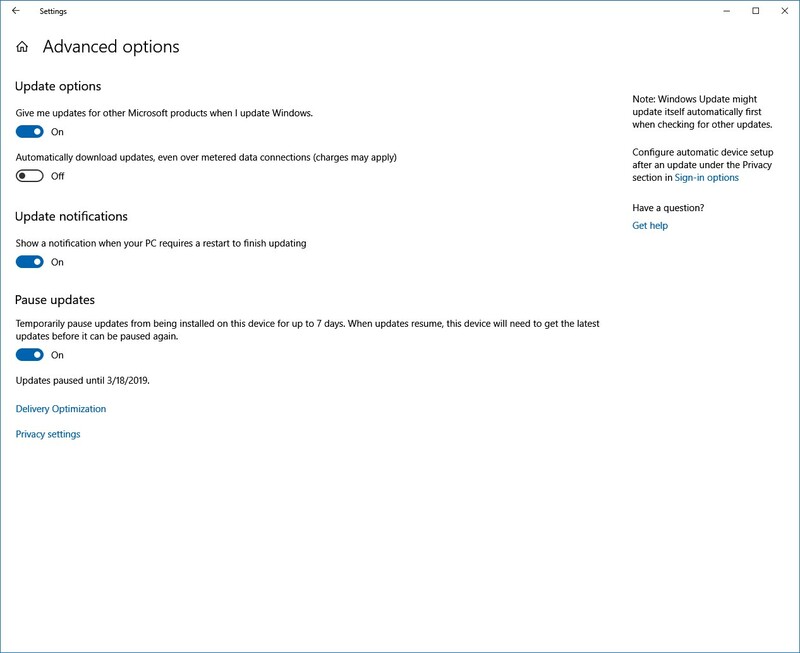 My question, silly it may sound to you Windows 10 pros, is how do I make sure during initial computer set-up that windows updater doesn’t just install every update in the book? Every article I’ve read says to click the check for updates button during install and let it do its work. Or is this something I need to do? Be sure you get Windows 10 PRO. Home doesn’t cut it. If you get a new Win10 computer. You need to set it up OFFLINE. When you first turn it on, be sure you are NOT connected to the Internet. Make your choices for set up as it does the first use startup. Then, go through the Settings app and change all the settings to your liking BEFORE you connect to the Internet. Change the menu to your liking. Everything. Hint: get a book like Woody’s “Windows 10 for Dummies” and read about all the settings before you even turn the computer on. Computer Configuration > Administrative Templates > Windows Components > Windows Update > Windows Update for Business > Select when Preview Builds and Feature Updates are received > set to Enabled > After a Preview Build or Feature Update is released, defer receiving it for this many days” set no. of days. Do you have Insider Preview builds, such as Release Preview ring, selected at Settings, Update & Security, Windows Insider Program? … and are you signed in as an administrator? I usually use a non-administrative account, elevating to an administrative account only when needed. I just found that I can’t elevate Settings by right-clicking and selecting “Run as Administrator” as I can with almost any other app (the only option for right-click is “Open”); deferring an update isn’t available to peons. Wazzup? Good point. I think you have to sign in as an administrator to defer updates on Windows 10 Pro. You also have to sign in as administrator to set a metered connection on Windows 10 Home, which Woody said months ago he would include in his monthly blocking instructions but still doesn’t. It is true if your PC is on Ent./Corp. network managed by IT via GPEdit. Not true if you manage your own PC. I missed the train on DEFCON-4. Do I have to wait a month now for the February updates? I know we’ve been through this before, but I keep forgetting. For Win7 or 8.1, updating by Group B methods, you can still proceed to update the February updates manually. For Win 10, or Group A Win7 or 8.1, it’s probably very close to releasing the March updates. Letting your machine do the updates automatically may find the March updates instead of the February updates, depending on timing. The Feb updates have been approved for DEFCON-4. They will always have that rating now. So you can install them any time. Be sure the updates you install have 2019-02 in their description (NOT 2019-03 as those are March updates) and go ahead and install them. What is the presumption( or Thread url) of HOW 1803 users will be migrated since 1809 has yet to appear and 1903 is allegedly just over the next hill. You should wait until 1809 is offered to your computer. MS is rolling it out slowly to (try) to avoid conflicts. When their AI shows it’s safe to install on your machine, it will be offered through Windows Update.